The following is the fourth message that we received in Egypt this past March 2012 over Equinox. You can find our other messages on our website at www.alunajoy.com under the "Articles for Personal and Planetary Transformation" link. It might be a good idea to read them in order as each message builds upon the previous one. We are sharing this message here with you just as we received it, in present time, with very little editing. We do this for a very important reason. We know that the messages that we receive are not just for our groups, but are for others as well. The Atlantean/Egyptian Masters and the Star Elders assure me that the message and the corresponding energy will be transmitted to you. So as you read this, you might want to imagine that you are with us. Also, always view the photos on the website that we share, as photos also hold some energy of the sites. 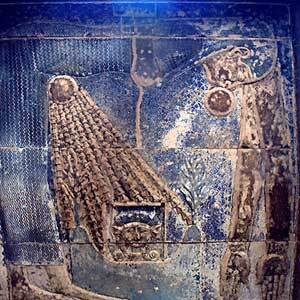 The Goddess Nut is giving birth to Hathor through the light of the Sun that comes from her womb. She says that all life comes from the place that they call the "Great Potential." This Great Potential is like a giant ocean, or it also could be perceived as a sound that reverberates throughout the entire universe. Last night when we were in our circle, they (the Guides, Guardians, Masters, the Ancient Ones, and the Star Elders) said that they were preparing the temple to be a chalice for this Great Potential - which we have entered into. The walls of all these temples are now filled to the brim with this ocean of potential. When I look (with my inner sight), this "ocean" looks like crystal clear, pure bubbling water, the purest of pure water imaginable. We are now being bathed in this beautiful water. In this water, there are little sparkling lights, and these are rays coming through the water from the Sun - the Great Central Sun - not our physical Sun. Our guides, guardians and angels would like us to invite these little particles of light into our hearts. If we observe them closer, these particles of light look like little, tiny lightning bolts. Our guides would like us to ask these light particles to enter into every single cell of our bodies. They say that we have already done the work to open and activate our hearts; and now as we bathe in this Great Potential, we begin to build a new body as well. One way to help build this new body is for us also to look into every cell of our bodies and add the light of the Great Central Sun. The light in each lightning bolt goes into every single cell of our bodies and becomes part of the molecular structure of our physical form. So we could feel tingly all over. Some of us may be noticing that already with a subtle tingling all over and a funny feeling in the solar plexus area. This tingling is the little bubbles of light. A reminder . . . neither the Goddess Nut nor any master of light would ever do anything to us without our permission. So this is our moment to give permission to allow every cell of our bodies to be blessed by these little lightning bolts of light. If this process feels too strong, we can ask the Great Potential to slow down the process. If we like it and want more, and we want it faster, we can ask them to speed it up. But either way, slower or faster, the universe will listen to us. In other words, if the entering of light particles is uncomfortable, "they" will slow it down. If we are ready for more light particles, "they" will give us more. Actually, it is incorrect to use the terms "they" or "it," because this light energy is the Great Potential. So it is really not an "it" or a "they," but the Great Source of All That Is. This lightening in our cells is going to activate our bodies in such a way that we will be able to access another layer, or level, of ancient truth that has been locked inside of us. This ancient truth is something from the distant past, before Atlantis, when the Earth realm was still a land of light and not a land of duality. This new knowledge that we will be open to receiving is from the past, yet it will become a foundation stone or a launch-pad for the new dimension that we are now building inside the collective consciousness of the world. The more we envision and dream this new knowledge of light (of non-duality), and feel it in our collective consciousness all across the planet, the quicker this reality will be manifested. Again, this is why we have come here and why the Star Elders had me entitle the group "The Atlantian Recovery Project." There are pieces of knowledge and light that we (and those reading this message) need to recover that will become the launch-pad, or the foundation stone, or that even can be perceived as a boat in which we can sail into the next world. Initiates from before and during pre-Atlantis, would use these lightning bolt lights in their cells to activate themselves, so they could remain free and limitless - so they could manifest with their minds and be masters of this physical reality. But when the age of Atlantis fell, they didn't use this technology in the elevated state we are seeing now, because it wasn't time to take the physical body with them into the next dimension. But now we are going to use these little lightning bolts of light in our cells to actually help us to take our physical bodies into the next dimension. No matter how the outer world appears right now, that this could not be further from the truth, it is true. This advanced lightning bolt activity is happening with all light beings across the planet. It is taking place within the light of the Great Potential and is moving into the cells of our bodies. This movement of light into the body's cells is giving us an opportunity to access a deeper place inside of us that we know has always been there, but, up until this time, we haven't been able to access it completely. That ability to access the light within is the next level of ancient knowledge we are to recovering, so we can use it as a launch-pad to the next frequency or level. So inside, I am asking her (Goddess Nut) if we can have a glimpse of what it will look like on the other side, or what "being on the other side" will mean for us. OK… I just get a blank page because the future isn't written in stone like the past (this world) has been. In the past, there had been grand and great divine interventions from master beings to help anchor this Earth . . . the world that we know now. But now this job has been handed over to humanity, because we have grown, and we have evolved. This job of anchoring light and accessing the deeper truth has been given to us now. So we are the Gods and Goddesses - not just one of us, but all of us. And now we come together with ONE heart and with one vision (many pieces of the vision put together) to create a whole piece, a whole world in which no one piece, and no one has been forgotten. Every single aspect of this new world has been thought out and dreamed of by each one of us (and those reading this), along with others all across the world that are working with these Equinox energies. We are in the process of creating a new world that has yet to manifest. That is why all of us who created this new world can't see beyond this present world, because the new world has not been fully created yet. Just as when people arrived here eons ago, they didn't know what this world would look like as well. This is the leap of faith we are facing. No one person has more power than any other despite the illusions that some have more than others. Each person has an equal piece to this puzzle of the new world, and the beauty of this is this time nobody can control, alter or misuse that power to control evolution anymore. This new world will be a world of unity in which each person will be considered equally as valuable as any other. All people will find their places and their jobs in this new world. Some work will be based on what they have done in the past, but their jobs will change form considerably, because the new world will be considerably different as well. Well, I think she (Goddess Nut) wants us to go down now to the Old Kingdom Chamber, if we can, and finish, because what we have done up here (in Nut's Side Chamber) has been in preparation for what will come next. In the Old Kingdom Chamber, we will pick up those pieces that are necessary for us to make that launch-pad for the new world. Also, there will be a great blessing for us in the Old Kingdom Chamber and an honoring, because many of us (and those reading this) already anchor the energy that is there. In other words, it is as though this building that houses Goddess Nut's Chamber wasn't our home; but where we are going next was our home. So they will be welcoming us back home. The Star Elders and guardians say we are now entering the void of the Great Potential - the place where there is nothing and everything. They want us to imagine that we are floating out in space away from any planet or any star, and in every direction that we look - in every direction - we only see an infinite universe. There is no defining factor out there where we are in this universe. There is no large planet . . . no large sun . . . just a sea of light and empty, void space - just like what actually is inside of every single cell of our bodies. We think we are just a tiny speck in this universe. Now they want us to imagine that we are not that speck anymore, but this entire universe is WITHIN us. That little speck - what we thought we were - now becomes the whole ocean of potential. That little speck that we thought we were now becomes a lightning bolt that activates the entire universe. In this space, we understand that we are not separate from anything, and we are a part of all of creation. This is the way of the Old Kingdom. This is what they believed and felt, and the space from which they operated. This is the piece of wisdom that they would like to give to us now. Because when we understand that we are all of creation and all of creation is us, there is nothing we can't create, do, think, feel, manifest or be in this space. In this great universe, as we look around inside of ourselves, we realize there is no end. There is eternity in every single direction. This universe radiates out from us endlessly in every possible direction, and it encompasses all of creation, and all of creation encompasses us. All of the guardians who are around us, encircling us, and have created this space for us have one thing to say. They want us to take this knowledge and awareness deep into our hearts . . . deep into the center of this universe . . . and they say "Welcome Home." They say "Welcome Home" because, as light beings, we were never wired to think that the body was our home. We were never wired to think that the one that we see in the mirror, that our city, planet, or even the dimension we are in was home. Once we claim a space like this, like who we think we are, or where home is, it limits us to that place. So what they are activating in us is an understanding of home that encompasses all creation so that we may come, go, move, travel, and create an experience in any direction that our consciousness takes us. All of the guardians are sending us blessings and love for having the courage to take on this physical form in a dimension of duality; for in so doing, we would have to forget most of who we are and why we were here. They appreciate the fact that we hold strongly to the light on the planet Earth through some of the darkest times creation has ever seen. They are telling us that only the brave ones came . . . only the brightest and the strongest came. They are telling us this, because every time we feel small, ineffective, not big enough, not strong enough or don't feel like we are worthy enough to be the beings that we truly are, we should remember this place. Remember our welcoming home back to creation where all things are possible. Group member Alice: So, before the bowls started, I don't know if you felt this or not. A big being came walking in - it was probably Horus - and he gave you a look, almost like "What are you doing?" He stopped right at the steps where the bowls are placed, and he looked at the bowls. I got the sense that he thought that this was going to be an offering for him. So he stopped and waited until the bowls started. Then the bowls started singing, and he was standing right in the corner next to them. At some point, he leaned over the bowls, and I thought that he was going to grab one, but of course he couldn't. Then, as I looked at his hand, it turned into a hawk's claw, and I realized that he had converted into a hawk, and he flew off down to the other end of the chamber. By the way Aluna, you glow in the dark. The glow is like phosphorescence. Aluna: Well, that makes sense. Horus does size people up, or check them out, because he is the great protector, and he wants to make sure that whoever is here is "okay." You will feel his presence strongly at Edfu. It is as though he is saying, "Who are you and why are you here?" He says "This is my space." He doesn't see people down here very often. 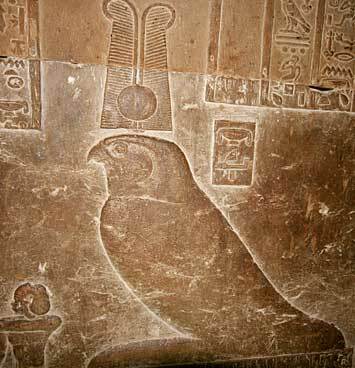 In fact I think Horus was saying "Why have we taken so long to bring a group down here?" We have never done work down here before. We have never had the opportunity. So we thank spirit for this opportunity. Now let us take time to integrate what has just been given to us all.